As was typical of Wright homes, the original site was far less complicated in design than the current was. None of the asphalt and none of the concrete in this view are original. In addition, the circular drive to the left (West) was collecting runoff coming down the hill and diverting it onto the concrete and against the topside of the retaining wall, which was the cause of much of the damage that was occurring on the base of that wall (which was repaired in the summer of 2012). To stop the flow, we engaged the concrete flatwork contractor who had done the new slab under the overhang to construct a new curb on the road end of the circular drive to remove the cut and make the full height curb continuous. 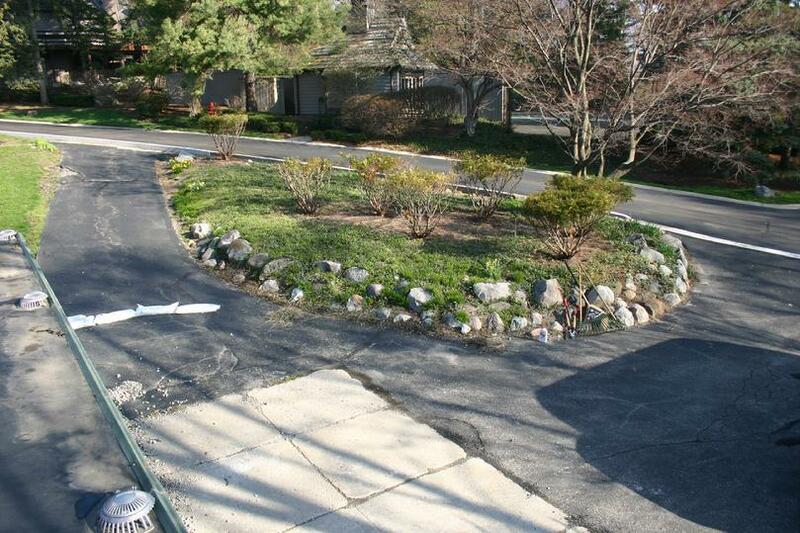 We also constructed a new access curb at the location of the original drive. As a temporary measure, we constructed a sand bag dam to collect runoff that fell onto the circular drive itself. Notably, the old concrete drive pitched to a catch basin (just out of view to the bottom of this photo), and despite best efforts we were never able to determine where that catch basin drained. We filled it with water on many occasions only to see it drain out with no apparent outfall. The answer was apparent when the catch basin was excavated. It didn't drain anywhere. The outlet pipe ran a few feet away from the catch basin structure and ended. That certainly didn't help the water collection problems on the high side of the retaining wall that had become so problematic. The first step was the removal of the asphalt and the concrete. The asphalt was disposed of off-site. The concrete was broken up and used to stabilize the South facing slope on the North parking cutouts, adjacent to the ravine. With the concrete and the asphalt out of the way, the next step was excavation of subsoil to a depth allowing for the installation of a proper base for the new crushed limestone drive. While the new design will not direct runoff to the drive as the old design did, and while we expect that any rain failing on the drive will permeate the sub-base and will not run-off, we nevertheless believed that a sub-drainage system was a good idea, particularly considering the damage to the adjacent retaining wall caused by run-off in the past. Trenches were cut, as seen in this photo, to accommodate that new under-drain system. Of course a drainage system that doesn't drain anywhere isn't an asset (as we already know). The outlet is cored through the retaining wall foundation and run through a short trench to a rip rap outlet in the ravine. The finished result is a north elevation true to the original Wright design. Some additional landscaping is necessary on the berm (ground cover and possibly one or two small flowering shrubs). The small area with the exposed gravel base to the right (West) of the limestone drive is set for the installation of permeable pavers (we are awaiting delivery). In the finished result all of the topsoil and the exposed paver base will be lawn (lawn has since taken root – it was just seeded in this photo). There is accordingly some additional fill necessary, as is the construction of a small path adjacent to the house leading to the South side parking areas together with the installation of the low voltage site lighting, but this view is pretty close to the final. We removed a large Magnolia tree to the West of the main entrance (to the right of the entrance in this photo) last fall. While it was attractive in the spring when it flowered, it was removed primarily because of the debris, moisture and attendant siding and soffit deterioration it created. There were mixed emotions about that (it certainly wasn't’t popular with the neighbors) but it wasn't’t original, and it did detract from the horizontal lines of the architecture. While some work remains, this view now appears as Wright intended it.